On Thursday and Friday of this past week the Tutor/Mentor Connection hosted its 29th Tutor/Mentor Leadership and Networking Conference since May 1994. More than 120 people attended. Some came from California, Nebraska, Wisconsin, Indiana, Pennsylvania and many came from the Chicago region and Illinois. You can see a partial list of participants here, which is an on-line attendee form which was created as people registered for the conference. Tomorrow I'm flying to Atlanta where I'll participate in the National Conference on Volunteerism and Community Service. While I expect more than 1500 people will attend the National Conference, I don't expect to be able to attend more than one workshop in any time frame, nor do I expect to meet any more people than I did at the Chicago conference. In fact, since I cannot find an attendee list on the National Conference web site, I suspect participants will not be able to connect with as many of the people who they might want to meet as they could from the Chicago conference, which was much smaller. While I'll be in Atlanta, the National NonProfit Congress meeting will be taking place in Washington, DC. More than 500 people will be attending and an attendee list is available on-line. While this does a great job of showing where a participant comes from, it still does not enable one participant to contact another participant directly. Thus, it's not likely that people attending this event will meet any more people than I'll meet in Atlanta, or that you could have met in Chicago. Yet, we're all concerned with similar issues of volunteerism and service, which must be funded by philanthropy. The most a conference can do is inspire us, energize us, and give us a few new ideas. The work of putting these ideas in place takes place after the conference and unless we have the resources, or help from others, it's not likely that many of these ideas will ever be used by the many people who are attending these events. If anyone who organizes an event builds in an on-line forum, or an interactive attendee list, they will enable participants to connect with each other. If this connects service providers, resource providers, evaluators, media and public leaders, it can lead to more good ideas taking root in more places. Thank you to everyone who volunteered time to participate in the Chicago conference. We hope you'll introduce yourself in online forums such as this and this, so we can continue to work to build a stronger infrastructure to support our efforts, which will lead to better supports for kids living in disadvantaged situations. More shootings in Chicago this weekend. Same as last year. Last May I wrote an article following some shootings in Chicago. If this concerns you, why not come to the Tutor/Mentor Leadership and Networking Conference being held in Chicago this Thursday and Friday (May 29 and 30). Here's the web site. If you're not in Chicago, join us in on-line forums. E – educate yourself – most of us do not live in high poverty neighborhoods, so we only understand the root causes of senseless shootings from what we read in newspapers. We also only read negative news in the media, so we’re now really well informed on where these events are taking place most frequently. Finally, while there is a perception that there are plenty of youth programs, we really don’t have a good understanding of the distribution of different types of youth programs, to different age groups, in different zip codes. The only way this will change is if each of us pledges to spend one hour a week reading books, articles and web reports, that illustrate the root causes of these shootings, or of poor performance in schools. Through our learning we can draw ideas that we use in our own actions. We can also begin to contribute information that other people use to support their own decision making. 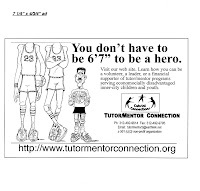 If you know of a tutor/mentor program operating in your neighborhood, see if it is listed in the Program Links or Program Locator at http://www.tutormentorconnection.org. If not, ask the program to contact the T/MC. Together we can create a shared library of knowledge, that helps us all understand where we have enough services, and where there are neighborhoods without services. Over the next few days people throughout America will honor the memory of men and women who have fought and died for the freedoms we enjoy. We have the right to share ideas on blogs like this only because men and women have died to give us those rights. Never forget. However, the battles that have been fought are not over. We are still in a shooting war overseas. We're threatened by terror every day. Our global environmental crisis is a growing enemy. And far too many people live in poverty in the US, and around the world. This poverty is a breeding ground for new forms of terror. How do we stop this? Where are the heroes of tomorrow who will fight on the battlefields of ideas and social justice? I lead a volunteer-based tutor/mentor program in which adults from many different business backgrounds volunteer time each week to serve as tutors, mentors, organizers, activity leaders, fund raisers, etc. to help kids living in the Cabrini-Green area of Chicago. To me, these volunteers are heroes. So are the kids who make an effort to be here every week. However, while I lead a single program in one neighborhood, I know that programs like this are needed in neighborhoods all over the Chicago region, and in other big cities all over the country. 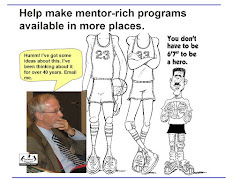 I created the Tutor/Mentor Connection in 1993 to try to help mobilize resources to support the growth of such programs. There have been many volunteers who have helped the T/MC over the past 15 years. There have been a growing number of interns who have also helped. I create a page listing different projects that students and volunteers have been doing to help the T/MC. To me, these people who devote their talent to helping us mobilize volunteers and raise dollars are also heroes. We need more of them. We need millions of them. We can reduce the number of men and women who die on future battlefields, if we increase the number who sacrifice time and talent to help end poverty and correct the many social injustices that exist in this world. As you celebrate and honor our fallen warriors, I encourage you to also look for ways to donate your time and talent to these other battlefields in the coming months and years. If you'd like to know more, come to the Tutor/Mentor Conference in Chicago next weekend, May 29 and 30. It happens every six months. I'm about two weeks prior to the Tutor/Mentor Leadership and Networking Conference, which I've hosted in Chicago every six months since 1994, and I'm stressing over the attendance, the speaker list, and all sorts of things that event planners always worry about prior to an event. I want it to go well. I want a good turnout. I want people to leave the conference with new energy, and new ideas. I want this to result in program improvement from now until August, or in new programs starting, so that every program in Chicago will have more success recruiting volunteers at the start of the 2008-09 school year, which is just 3 months away! You can see a partial list of attendees here. But why should I be stressed? I'm doing this to help other programs in other neighborhoods and other cities. I'm also doing this to help Cabrini Connections, which is the program I lead. Over the past 35 years I've learned that the time I spend organizing these events, and networking with others, results in many benefits to my own program, and to myself. I find new ideas. I benefit from the public awareness. I find friends who help me stay involved with this work, year after year. I've also learned that these events help us generate public attention for tutoring/mentoring, and this helps us recruit volunteers. From my experiences working in advertising for the Montgomery Ward corporation, I've learned the importance of keeping your advertising in front of customers on a regular basis. Thus, the conferences, are part of a sequence of events that not only draw programs together, but draw volunteers and donors to our web site, and to different programs throughout the Chicago region. From this image you can see that what we do in May is intended to influence what happens in August, November and next spring. Thus, the conference not only benefits me, it can benefit everyone else who offers tutoring/mentoring in Chicago, or in other cities. Thus, I'm stressed. I know how important it is to get the attention of thousands of potential volunteers and donors and I can't do it by myself. This conference, and the Tutor/Mentor Connection, only work when others see the conference as an event that supports their own program, and expands their own personal network. I've learned from many years of experience that what happens next week, is what is intended to happen. No matter how many people attend the conference, those who do attend will find value. Here's what some people have said after past conferences. I'm sure many will offer similar comments after this one. There's no time to be stressed. As soon as this conference is over we move on to the next event. I hope you'll join us. Visualizing our goals for tutoring/mentoring, violence prevention, education, etc. schools are trying to teach them. the reauthorization of the Elementary and Education Act, in particular. aside competing agenda, and this may prove undoable. " 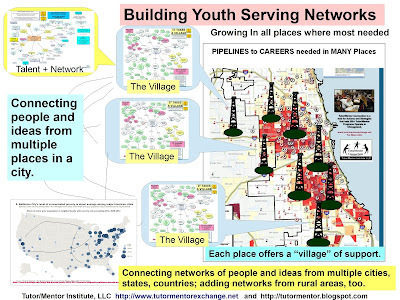 On the Tutor/Mentor Connection web site I've used maps and charts to illustrate how we need to focus on all of the high poverty neighborhoods where kids need extra help in order to succeed in school and live free of poverty. Today, I listened to a presentation by the rock star BONO, as he called for 1 million activist to get involved in creating social justice for people living in Africa. Imagine if he were using maps like those I'm trying to create, to draw people who could help to all of the places where help is needed, and will be needed for the next 20 or more years. My friend at UCLA, BONO and the T/MC all have the same challenge. We need to get millions of people to look at our maps, read the information we provide on our web sites, and then act in one way or another, over-and-over, for many years, and in many places at the same time. Even with all of the power and celebrity that BONO has, he is asking for help. Even with all of the resources at UCLA, my friend is asking for help. I don't have nearly as much power or wealth as either of these leaders, yet I'm asking for the same type of help, and so are the thousand of people working in isolation and obscurity in high poverty neighborhoods around the world. There are many entry points to getting involved, (such as the May 29 and 30 conference in Chicago), and individual calls to action can each attract some people to some of these places. However, until we connect these entry points, and tie them to maps, we'll never get enough people, looking at all of the places where help is needed, nor staying involved as long as they need to be involved. 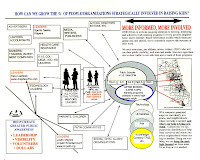 During the spring 2008 school year term, two students from an Information Visualization class at the University of Indiana took on a project for the Tutor/Mentor Connection. The goal was to visualize the call to action that the T/MC is communicating via pdf presentations so that it would resonate with leaders in businesses, universities, churches, who then would apply these ideas to helping draw needed resources to volunteer-based tutor/mentor programs in all high poverty neighborhoods of big cities like Chicago. This is not a completed project, but it is a step toward what we're trying to communicate. It shows how students in universities can use their talent, and their learning, to do real-world work that helps non profits achive their important social missions. It also shows where poverty and poorly performing schools are located and this is where tutor/mentor programs are most needed. If you're a volunteer, or donor, or potential university or faith partner, you can click on the map in the Tutor/Mentor Program Locator, and learn what organizations are in this area, and what forms of tutoring and/or mentoring they do. Learn more about ways university and high school students might use their time and talent to support the T/MC or other social benefit organizations. Click here and here. For most of the people in America, inner city violence is just a sound byte on TV, or a newspaper headline. It's not something they really understand, thus it's not something that offers more than simplistic solutions. It's a complex problem. A friend of mine works for CEASE Fire, and sent me a link to an article about Cease Fire, and inner city violence, from the New York Times Magazine, written by Alex Kotlowitz. I encourage you to read it. I've known about Cease Fire for more than 10 years and have had its founder on my newsletter mail lists. We've never found ways to connect our strategies of prevention via tutoring/mentoring, and triage, or street intervention, right at the point of acts of violence. I think we've got to find ways to apply multiple pressure points to this problem. No single solution is enough. I use maps to try to map this conversion of different strategies, and host the conference in May and November to try to draw people from different solution-channels together, so that relationships, and integrated strategies might develop. However, until funders become willing to fund these multiple strategies, in the same geography, for many years, we'll each compete with each other for core resources, and this competition will prevent most of us from finding ways to work together. If you look at the links library on the T/MC web site, they go to many different sites, all with valuable information, and valuable programs. How do we create advertising to draw millions of viewers, like the readers of the New York Times magazine, or an Alex Kotlowitz book, to sites like this where they all spend some time, talent or dollars to support one or more of the different groups listed. If we can generate enough traffic, and enough consistent funding, we can relieve the negative competitive pressures, and maybe generate some more complex and integrated problem solving. Every day I send one or more letters to people in Chicago and around the country, introducing myself, and inviting these people to visit our web sites, and connect with us in some form of on-going learning and collaboration aimed at helping more and better tutor/mentor programs be in the lives of inner city youth. I'm writing one right now, and I decided I'd share it with those who read my blog. I hope you'll forward it to people in your own network, as this graphic suggests. This letter is written to Catherine Jordan, project manager for the National Partnership for Quality Afterschool Learning at the Southwest Educational Development Laboratory in Austin, Texas. I'm writing to introduce you to the second part of our organization, the Tutor/Mentor Connection (T/MC). I started my volunteer work with tutor/mentor programs in 1973 at the same time as I was beginning a 17 year advertising career with the Montgomery Ward corporation. We had 400 stores in 40 states, and used advertising to draw customers to these stores every day. We also had another team of people working to make sure we had stores near customers, and that each store had well trained people, and products and services that would appeal to customers. Between 1975 and 1990 I began to create a network of Chicago area tutor/mentor programs, encouraging the group to meet regularly to share ideas and build supportive relationships. As I did this I recognized a pattern in media and public leadership that I call the "Camel effect". Every so often there would be a surge of public indignation following some tragedy, such as a school shooting, or a report, such as Nation at Risk, that would cause the newspapers and editorial writers to call for some action. However, when that happened, they only pointed to a few brand name youth organizations as the solutions, and they only pointed to a few of the high poverty neighborhoods of Chicago as the location of the problem. Furthermore, this public attention only lasted a short while, as the media and our leaders would soon be drawn to some other crisis. This surge in attention is happening right now in Chicago, as the media are focusing on the tragic killings of a growing number of inner city kids. In our advertising at Wards we knew that we needed to keep our customers focused on our stores and services every day, and we needed to make every store as good as it could be, in order to attract repeat customers to each store. Thus, I created the Tutor/Mentor Connection in 1993, with a goal of helping constantly improving, volunteer based tutor/mentor programs be available in every high poverty neighborhood, following the same principles that our company was using to try to make sure high quality stores were available to shoppers all over the country. In the Program Locator and Chicago Program Links sections of the T/MC web site, shoppers can learn about different tutoring/mentoring programs throughout the region, and choose what area of the city they want to support, and which programs in that region they want to help. In many cases there are few, or no programs, thus a shopper (volunteer or donor) might need to help start new programs, in order to serve the youth in that region. I believe that a high quality non-school youth organization must have a base of adults committed to the lives of the children they serve, and that extra adults, who don't live in poverty, and who can model a variety of jobs and careers, need to be involved as tutors, mentors, coaches, fiends, advocates, etc. If the youth organization makes a commitment to "do all it can to assure that the children are in jobs and careers by age 25" then it is the adult volunteers who need to stay connected to the organization, and its youth, so that as kids finish high school or college, there are people beyond the poverty neighborhood where these kids live, who can open doors to job opportunities, and provide support to career growth. This is what a volunteer-based tutor/mentor program is to me, and what we try to do at Cabrini Connections. Through the Tutor/Mentor Connection we work to help other programs get the resources they need to build and sustain similar long-term commitments to the youth they serve. I hope you'll take a look at the T/MC and see how we're using maps, the internet, conferences and an on-line program locator database to help volunteers and donors find the various programs in the Chicago region. This is a strategy that any city can duplicate in order to assure that good programs, with adults who care, are in more of the places where they are needed. I'll look forward to hearing from you. I hope the Youth Today article draws a few more people toward this idea of adult involvement and mentoring as part of a strategy of "no child left behind".